“HEY, GOOD LOOKIN’!” Curt Simonson’s dream of having a restaurant on wheels recently became reality. What’s Cookin’ serves up Chicago-style hot dogs, Italian beefs, and other classic lunchtime fare at locations throughout Eau Claire. Curt Simonson had always wanted to open his own mobile food trailer or restaurant. Starting with his days as a cook at Double Days Sports Bar and Grill, cooking has been a part of his life for years. It was about time that Simonson shared his passion with the Chippewa Valley, so he opened his own restaurant-on-wheels, called What’s Cookin’. 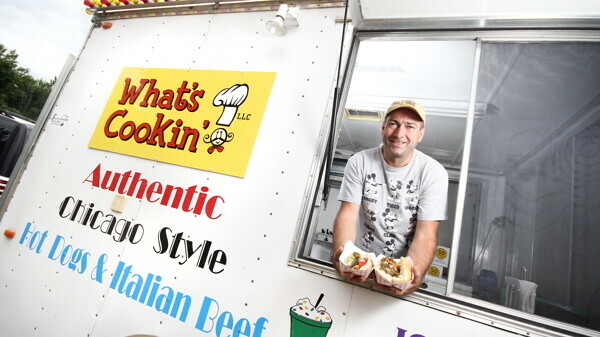 Perhaps you’ve seen Simonson’s smile inside the What’s Cookin’ trailer with “Authentic Chicago Style Hot Dogs & Italian Beef” printed on the side in bold lettering. He bought it in June 2012, and after jumping through the city permit hoops for about a year, he was able to get the business underway. His business plan is simple: Serve great food, be kind and talkative with customers, and they’ll keep coming back for more. His lunch menu features Windy City favorites such as the Chicago-style hotdog and Italian beef sandwiches, as well as regular hot dogs and pulled pork sandwiches. He also sells ice cream sundaes, cookies, and root beer floats. The food cart is always moving from place to place. Local companies often enjoy Simonson’s setup outside their worksites, giving them another lunch option for their employees. He said that students can expect to see him around Water Street this school year, and people can contact him to have him work events, locations, or just to set up shop anywhere for a Chicago-style lunch. The What’s Cookin’ Facebook page always shows where he’ll be that day. To learn more and to find out where Simonson’s mobile food trailer is parked on a given day, search for “What’s Cookin’ LLC” on Facebook.